What has happened to the Yellow Label? The distinctive logo of Deutsche Grammophon, the home of Herbert von Karajan and the Berlin Philharmonic, used to be a standard that meant seriousness of content. Since the absorption of the company by Universal Music Group, fewer and fewer of their releases have been of much interest. By this I do not mean the holdouts, veteran artists who remain with DG, like the Lucerne Festival Orchestra, Daniel Barenboim, Martha Argerich, Anne-Sophie Mutter, Maurizio Pollini, or Maria João Pires. (Although Chinese pianist Yundi Li was cut by DG in 2008, he was re-signed in 2012.) UMG pop music practices have invaded the company's handling of particularly its younger stars, or so it seems. How else can one explain the packaging of this new release by the piano duo of Alice Sara Ott and Francesco Tristano, with a spread of "heroin chic" photographs? This is doubly a shame because it detracts from the only thing that should really matter, which is that both of the artists featured are talented musicians. I missed the chance to hear Ott, when she played Liszt's second piano concerto with the NSO last year, but the Ionarts review of one of her Munich appearances was not encouraging. Her recordings on the other hand, especially of the Chopin waltzes, have been promising. Of course, her recordings are dutifully flogged by the flacks at Sinfini Music, which is controlled by Deutsche Grammophon: one particularly facetious post, author unspecified, is titled "Everyone's Talking about Alice Sara Ott." Well, everyone at her record label is, at least. I first heard Ott's partner in this recording when he was still using his last name, Francesco Tristano Schlimé, and he played an intriguing recital in 2008 at the French Embassy. 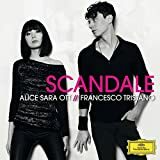 Their disc together, in spite of its title, Scandale, is a fairly mild affair, centered on a somewhat slow and dull two-piano performance of Stravinsky's Rite of Spring. (Listen to Fazil Say's recording -- with Fazil Say -- to hear what is missing.) While their version of Ravel's La valse quickens one's pulse more, Rimsky-Korsakov's Scheherazade also offers little of note. The opening work, Tristano's own A soft shell groove, features a few bars where the players are heard stomping their feet or something. My opinion of his compositional style has not changed since that 2008 recital, though, when I wrote that it was "repetitive, if with appealing drive, and short on ideas able to sustain interest for long." Alas, Ms. Pires is not a hold out for she was pushed out. She now records for another label.